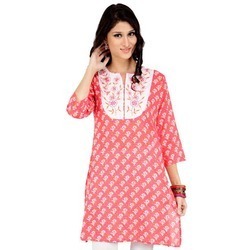 Pioneers in the industry, we offer cotton printed ladies kurti and pink printed ladies kurti from India. Enriched with vast industrial experience, we offer an extensive range of Cotton Printed Ladies Kurti that is acclaimed among the clients for high quality and smooth texture. We are enlisted amongst the reckoned names in the industry, offering an extensive range of Pink Printed Ladies Kurti that are treasured for elegant looks and are designed as per the latest fashion trends. Our entire product range is durable in nature and is designed with perfection. We offer them in standard sizes and add graceful look to the wearer.